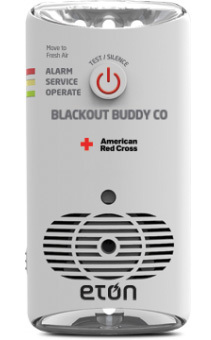 The Eton Blackout Buddy CO keeps your family safe three ways. Constantly checks for carbon monoxide in the air. It is UL2034 certified and will blast an alarm and flash its light when your CO levels are too high. Even if the power goes off, you will have 7 days of battery backup protection on the alarm. Provides a constant night light - great for dark hallways. May be set to Off or Auto. Always charged, emergency tri - LED flashlight. Just plug it into an AC outlet (preferably near floor) and forget it. Copyright 2015-2016, Universal Radio, Inc.